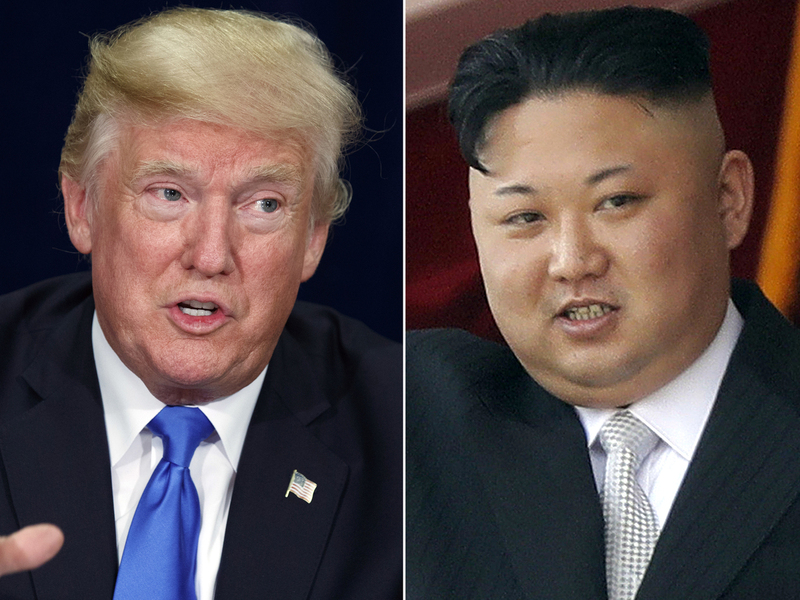 North Korea Is President Trump's Biggest Foreign Policy Headache For 2018 : Parallels After trading bellicose barbs with North Korea throughout 2017, the U.S. heads into 2018 with an increasingly capable foe and no clear diplomatic exit ramps to temper the tensions. President Trump and North Korean leader Kim Jong Un are expected to continue to square off in 2018. Stopping North Korea's nuclear program is the thorniest foreign policy problem for the U.S. president in the new year, but then again, the same was true a year ago. What has changed in 2017 is North Korea's capability and the United States' approach. Kim Jong Un begins each year with a New Year's Day address. This year, it began with a note that his military "entered the final stage of preparation for the test launch of intercontinental ballistic missile." President-elect Donald Trump responded with a tweet saying, "It won't happen!" As we look back on the year, Kim was the one who delivered on his promise. And he did so by July 4 — American Independence Day — with a successful test of an ICBM. The crisis mounted and then abated afterward. Remember Trump's "fire and fury"? And Kim's plan to bracket Guam with missiles? By Aug. 29, North Korea detonated a nuclear bomb that analysts believe was 10 times more powerful than the last test, a year prior. "Donald Trump and Kim Jong Un are like professional wrestlers who go round after round, with plenty of trash talk ... but never really come to blows," writes John Delury, an associate professor at Yonsei University Graduate School of International Studies in Seoul. "But then we remember that these two characters are commanders in chief of real armies. ... In these conditions of mutual hostility and ignorance, things could go wrong, fast." The North Korea situation holds perhaps the greatest risk of nuclear war of any conflict on Earth, and a resolution is complicated by factors that reach beyond the immediate countries involved. The simplest explanation for the intractability is this: The six powers with the most stakes regarding North Korea have conflicting objectives, backed by solid reasons not to compromise. North Korea won't give up its nuclear weapons because it keeps the Kim regime in power. The Kim regime has unequivocally stated that its nuclear weapons are not, and never will be, up for negotiation. With each test, Kim strengthens his deterrence capability against external threats while enhancing himself as a leader standing up to the U.S.
China and Russia won't abandon the current North Korean leadership, despite wishing it would denuclearize. The U.S. and its allies Japan and South Korea won't stop trying to pressure North Korea to give up its nuclear weapons. And thus the impasse. "These goals have proven inflexible because they represent a much wider struggle between the established liberal world order and resurgent authoritarianism," says Ben Forney, a research associate at the Asan Institute for Policy Studies in Seoul. He argues that North Korea is a test case for whether the Western-led international system will endure in Northeast Asia. "Russia's encroachment into Ukraine and annexation of Crimea, China's island-building in the South China Sea and North Korea's nuclear weapons program are not isolated events," Forney says. "They are deliberate actions by resurgent powers that share a common goal: to challenge the liberal international order." Russia — which, like North Korea, is under U.S. sanctions — "seeks greater influence in Europe; China in East Asia," Forney says. "Both of these objectives necessitate the reduction of U.S. power, and there is no one with better anti-U.S. credentials than Kim Jong Un. Allowing his regime to fall would be seen as capitulating to the Western narrative that powerful nations and institutions have a right to intervene in the affairs of destabilizing states." On the flip side, you have the U.S., South Korea and Japan. They represent North Korea as the antithesis to norms they champion. It's regarded as fact that North Korea is a nuclear state, but for the U.S. to accept that would be tantamount to acknowledging that liberal democracies no longer have the strength or the will to promote their interests, Forney says. Delury argues one of the key reasons that crises persist is a misread of the security problem itself. The U.S. is preoccupied with Pyongyang's weapons capabilities instead of what he considers the root of the problem, which is why North Korea feels it needs weapons: the hostile relationship between North Korea and South Korea and the U.S.
"The theory of victory should be defined in terms of terminating the enemy relationship between North Korea, the United States and South Korea. A gradual process of denuclearization can be a measure and outgrowth of that transformation, but not its precondition," Delury writes. Meaningful international cooperation can only occur when China, the U.S. or North Korea is ready to abandon something it has thus far been unwilling to consider giving up, he believes. Until then, the situation will remain unresolved and only likely to deteriorate. Then there is the most pressing practical problem: How would you define the U.S. policy on North Korea? When it comes to the issue, there are three overarching options — trying to weaken North Korea through sanctions and isolating it from the international community; a military strike or threatening one; and diplomacy — engaging with Pyongyang through talks. The Trump administration is trying all three at once and sometimes sending conflicting messages. Trump and his ambassador to the United Nations, Nikki Haley, threaten "utter destruction" and say "talks won't work." Secretary of State Rex Tillerson said this month that the U.S. wants to talk without precondition (before walking it back). And in the actions-speak-louder-than-words realm, the starving of resources via sanctions has steadily increased throughout the year. "The total lack of consistency, the total inability to separate rhetoric from substance — all of it makes people throw up their hands and be like, 'Well, I don't know what to believe,' " said Van Jackson, a former Defense Department Asia specialist who now teaches at Victoria University in New Zealand. "For statesmen, there couldn't be anything more valuable than credibility, right? The ability to make commitments that others will believe. We're seeing a hollowing out of U.S. credibility across the board. ... So even forgetting that we have a long history of mutual bad faith with North Korea, how can Kim Jong Un sit there and say, 'Oh I'd love to sit down with Tillerson and see what he has to say!'? It's all going to be b.s. from Kim Jong Un's perspective." So, here we are. Kim Jong Un will lay out his perspective on New Year's Day 2018. The world will be watching.